The Cornish language is still a living tongue after more than a thousand years surviving next door to one of the world’s most spoken languages. It was revitalised from its ‘near-death’ throes in the 19th century to a state where it is being seen on buses, trains and road signs. More importantly, there is a growing community of speakers – with some who have learnt to speak it directly from their parents as a mother language. So, Cornish language supporters, learners and speakers will be using their social media on 21st February 2017 to join in an international event online; The Mother Language Meme Challenge. Co-organised by Rising Voices and the Living Tongues Institute, First Voices Cultural Council’s Endangered Languages Project, Indigenous Tweets, First Languages Australia, and the Digital Language Diversity Project, as well as a number of global partners, the Mother Language Meme Challenge invites speakers to put their creativity and passion for languages to work by creating a meme in their mother language. This is a fun online campaign to commemorate International Mother Language Day by creating a humorous or reflective internet meme in a native tongue. The opening ceremony of the celebration will be held at UNESCO HQ in Paris on 21 February 2017. Cornish (Kernewek) has made massive leaps in its revitalisation in recent years and is now being recognised by many business leaders as having a great part to play in developing Cornwall’s distinctive brand for the benefit of trade, employment and tourism. 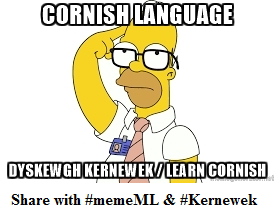 People in Cornwall are being asked to create their own memes (social media images with a caption) about the topic and to share/tweet them with the hashtags: #memeML, #motherlanguageday & #Kernewek. The international organisers suggest that online meme-generators are an easy way to do this. Cornish is a Celtic language and closely related to Welsh and Breton. It is also connected to Irish, Scottish Gaelic and Manx in the Celtic language family. Latest research shows Cornish did not completely die out as the last native speakers lived up until the start of the 20th century, when the revival was already well underway. This event will be covered by the Cornish language’s radio service, Radyo an Gernewegva, on anradyo.com. This release has been prepared as part of Radyo an Gernewegva’s work for the Cornish language as the service acts as a media partner to language organisations.